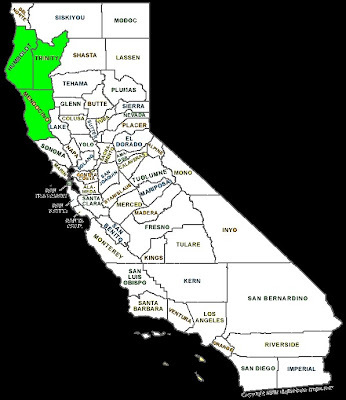 California's famous marijuana-growing region, the "Emerald Triangle," shown in green. In 1954, the Ukiah, California Kiwanis club invited Reno Bartolomie, a special investigator for the DA in Mendocino County,to speak at one of their weekly dinners. Bartolomie, who would later be elected sheriff of Mendocino County, discussed the state's growing concern with drugs and told the group their county "is fortunate in being one of the clean spots in the state" (1). 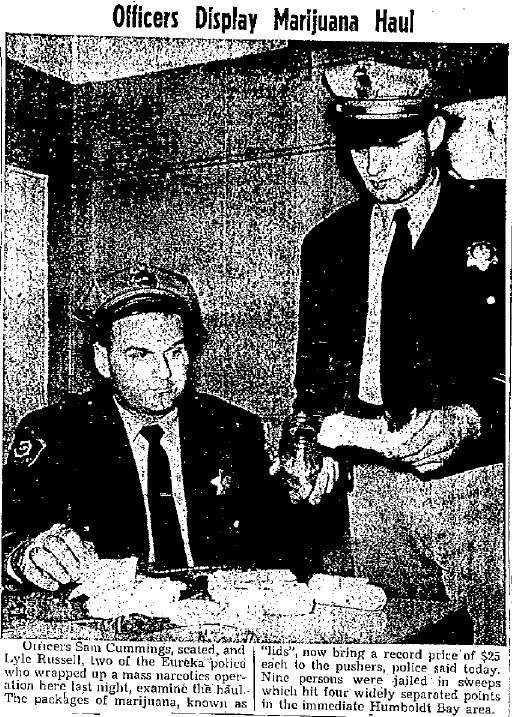 Eight years later, as sheriff, Bartolomie could no longer make that claim, as by August of 1962 his deputies oversaw the pullup of 121 marijuana plants from the backyard of Mendocino City resident Donald Treadwell (2). Along with Humboldt and Trinity counties, Mendocino County is now part of northern California's "Emerald Triangle" - the country's hotbed of outdoor marijuana farming. 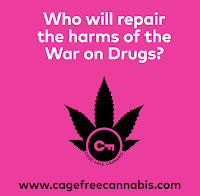 But before the back-to-the-land hippies began cultivating marijuana in the warm, rugged region in the 1970s, large-scale growing operations stateside were few and far between (3). Of course, it has been well-documented on this blog that California's climate allowed dozens, probably hundreds of people to grow their own supply - and sometimes a little extra for the black market - pretty much anywhere (4). One L.A man in 1959 grew 550 plants in his backyard (5). But before the 1980s most of the nation's illicit marijuana was grown in and smuggled from Mexico, Jamaica, or Colombia (6). However, a healthy foreign supply did not keep enterprising Californians like Treadwell from trying to get a piece of the black pie. Treadwell's partner, Jacques Mion, was an artist from San Francisco, a city that harbored more than its share of pot-smoking beatniks in the fifties (7). It is likely that either one or both partners smoked; deputies confiscated a "pipe" which, given the lack of poppy seeds or plants, was probably not "used for opium" (8). It was the cultural descendents of beats like Mion who would usher in Mendocino County's era of large-scale, high-quality marijuana production. In the early Sixties, most of the pot in Mendocino County looked like this - neatly packaged bricks smuggled in from Mexico. Source: "Nine Arrested Here on Narcotics Raid, Shots Fired at One," Eureka Humboldt Standard, May 18, 1960. Treadwell and Mion were not the only Californians trying large-scale growth in the early sixties. In April 1963, behind a bowling alley in urban Torrance, authorities discovered 1,500 plants growing in "orderly rows" amongst weeds (9). The grow was said to have been worth $20,000. But that doesn't beat Palmer Glover's operation, busted up in May 1962. 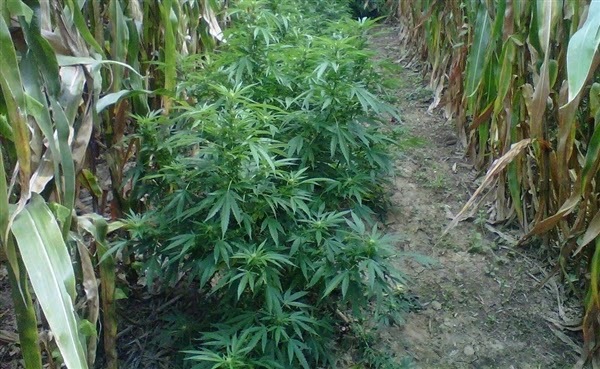 The Bakersfield resident tended a huge field of corn and string beans, and between the crops, "in neat rows," he raised 3,300 marijuana plants (10). Glover's grow was among the largest in state history at the time, but more fascinating than its scale was its purpose: Glover planned to sell the crop at the Seattle World's Fair for $100 a pound. Had Glover's product made it to the World's Fair before he got busted, it would certainly have competed with the imported stuff. Early large-scale growers like Treadwell, Glover, and the anonymous urban farmers who planted their crop behind a bowling alley represent a group of illegal entrepreneurs who did something 100 percent American: They recognized increasing demand for a foreign product that was, thanks to law enforcement's continual crackdowns on smuggling, also getting more expensive, and decided to produce it themselves. Large-scale growing was not limited to the early Sixties or California; I have written about huge pot farms in 1940s Colorado, and authorities took 525 pounds of domestic marijuana from a farm in Georgia a year after Treadwell got busted (11). Nevertheless, these cases offer important insight into the growth of the state's now-famous marijuana industry. As many more Americans got "turned on" to marijuana in the 1960s, and as law enforcement stepped up the pressure on drug smugglers, Californians were discovering that many parts of their state offered environmental conditions suitable for large-scale marijuana production. The climate and environment may have been right, but in 1960 marijuana farmers in California were still missing the other critical factors that would drive the state's marijuana boom in the 1980s: the feds' aggressive raiding, the spraying of Mexican weed with the dangerous herbicide Paraquat, large populations of counterculturists in the right areas, and hybrid strains of more potent pot. Yet they knew a good market when they saw one, and, along with hundreds of other small-time growers in the state, continued to push California away from Bartolomie's 1954 declaration of "clean" and toward its current "Emerald Triangle" fame. 1. "Bartolomie, Scudder Address Kiwanians at Weekly Dinner Meets," Ukiah Daily Journal, September 30, 1954. 2. "Marijuana Garden Downfall of Mendocino City Suspects," Ukiah Daily Journal, August 13, 1962. 3. 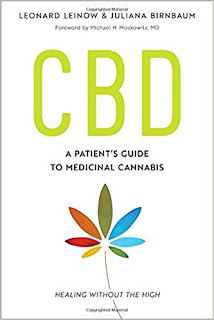 Jim Rendon, Supercharged: How Outlaws, Hippies, and Scientists Reinvented Marijuana (Portland: Timber Press, 2012), 63. 5. "Marijuana Plants Growing in Yard," Appeal-Democrat (Marysville-Yuba City, CA), August 25, 1959. 6. "U.S., Mexican Authorities Coordinate Drive on Dope," Oxnard Press-Courier, May 20, 1960; Rendon, Supercharged, 65-7. 7. Ward Cannel, "The Question Is: Can a Beatnik Remain a Beatnik in a Brooks Brothers Shirt?" Bakersfield Californian, July 2, 1959. 8. "Marijuana Garden Downfall ... "
9. "Marijuana Farm revealed near Torrance," Redlands Daily Facts, April 17, 1963. 10. "Sheriff Ends Marijuana Farm Project," Bakersfield Californian, May 19, 1962. 11. "8-foot marijuana grown amid corn," Oxnard Press-Courier, November 22, 1963.